GridBee GS-9 and GS-12 submersible electric mixers from Medora Corporation help municipalities meet potable water quality standards and prevent ice damage affordably. 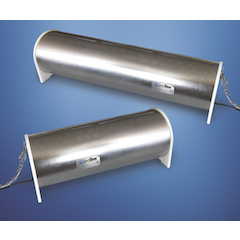 Available in two sizes depending on tank size and flow rate, GridBee GS mixers pull new incoming water off the tank floor and mix it throughout the water column. They provide thorough mixing, uniform water age and disinfectant distribution while eliminating stagnation and short-circuiting. In cold climates, GS mixers help prevent ice buildup inside tanks.